One of the most frustrating experiences with Julia is that many tutorials you find online don’t work any more because the language has changed so much. Creating a new package is one of the most fundamental tasks to a language, but it took me quite a while to figure that out. In the end, I managed to submit Getopt to Julia’s central registry. It implements a Python-like getopt in 70 lines, much shorter than ArgParse.jl. This blog post explains what I have learned in this process. Here, a line starting with “sh>” indicates a shell command line, “julia>” denotes the Julia REPL and “pkg>” denotes the pkg mode, which can be entered by typing “]” in REPL. This updates the “[deps]” section of “Project.toml”. You probably need the “Test” package because apparently without it, you can’t run tests for your new package. Now, you can edit “Foo.jl/src/Foo.jl” to write the actual library code. Remember to read the documentation on Modules. Your package won’t be found in the Julia package list because that page is outdated. Julia doesn’t have built-in package search. The best place to discover packages seems Julia Observer. It has issues, too. For example, it doesn’t tell you which Julia versions a package supports. It is very slow. Getopt is the first package I developed in Julia. The workflow described here might not be optimal. I will update this post once I learn a better solution. Many command-line tools need to parse command-line arguments. In C, one of the most widely used functions for this purpose is getopt() and its GNU extension getopt_long(). However, these functions have two major issues. First, they are not portable. getopt is part of the POSIX standard but not the C standard; getopt_long is not part of any standards. In addition, getopt may behave differently depending on whether GNU extension is enabled. Using these functions can be tricky. Second, both functions rely on global variables, which may interfere with more complex use cases (e.g. sub-commands). These limitations motivated the development of several other argument parsing libraries. While these libraries often have cleaner APIs and more functionality, most of them lack some getopt_long features. This blog post reviews several argument parsing libraries in C/C++ and introduces my own getopt replacement at the end. The following table lists common features in argument parsing libraries. Stars indicates getopt_long features. argh* C++11 semi N N N N N N ? argp C/C++ Y Y Y Y ? N Y ? argparse* C/C++ Y Y N N ? Y Y ? args* C++11 Y Y Y N ? Y Y ? argtable* C/C++ Y Y Y N ? Y Y ? cxxopts* C++11 Y Y Y N ? Y Y ? CLI11 C++11 Y Y switch N N Y Y ? tclap C++ ? N N N ? Y Y ? Notably, many libraries discard the relative order between options, arguably the least important getopt feature. They often add type checking and automatic help message formatting. I think type checking comes in handy, but message formatting is not as valuable because I prefer my own format over theirs. The list in the table is of course incomplete. Some important ones that are missing include Boost’s Program_options and Google’s gflags, both of which are much heavier libraries. I haven’t spent enough time on them. If you have relevant information on them or your favorite library that is missing, or you think the table is wrong, please help me to improve it. Thanks in advance! I occasionally care about the order of options, a feature missing from most non-getopt libraries (argp has it but is not portable). In the end, I developed my own library ketopt (examples here, including one on sub-command). It is implemented in ANSI C and doesn’t invoke heap allocations. Ketopt has a similar API to getopt_long except that 1) ketopt doesn’t use any global variables and 2) ketopt has an explicit function argument to allow options placed after non-option arguments. Developers who are familiar with getopt_long should be able to learn ketopt quickly. Command-line argument parsing is relatively simple (ketopt has <100 LOCs), but implementing it by yourself is tricky, in particular if you want to match the features in getopt_long. My ketopt is largely a portable getopt_long without global variables. In addition to mine, you may consider gopt in C. It is small, easy to use and supports key getopt_long features. For C++ programmers, cxxopts is a decent choice. It is feature rich, close to getopt_long, and has similar APIs to Boost’s Program_options and Python’s argparse. I strongly discourage the use of libraries deviating too much from getopt (e.g. argh and tclap). Most end users expect getopt behaviors. When your tool acts differently, it will confuse users. Command-line interface is one the first things users experience. Please get it right. TL;DR: The code is available in klib/kavl.h with a toy example in comments and at the end of this post. kavl_test.c tests correctness. Insertion performance is evaluated separately. I need a container which, upon each insertion, tells me the number of smaller objects than the inserted one. A natural choice is a binary search tree. We store at each node the number of objects descended from the node. On insertion, we sum over numbers on nodes immediately left to the search path to find the answer. This algorithm sounds easy but is not implemented in existing libraries. In addition, I also want to learn how AVL tree and intrusive containers work down to every detail. So, here we go. An intrusive container is a container that requires each object in it to have one or multiple predefined member variables. Such a container intrudes the object definition – this is how it is named. kavl.h is broadly similar to khash.h. It requires you to expand a macro to insert the actual implementation into your code before using it. As an intrusive container, kavl.h doesn’t call the malloc() equivalent inside the library. In fact, it doesn’t even depend on libc. Like my other container implementations, kavl.h strives for performance. It avoids recursion, and doesn’t keep a pointer to the parent node – this saves space at the cost of code complexity. A popular way to implement intrusive containers is to use offsetof, as is described in this blog post. This strategy avoids all the macro magic, but makes it impossible to inline simple comparisons. It is less efficient. A non-intrusive container allocates memory inside the library. It is non-trivial (if possible at all) to replace the allocator used in the library. A true intrusive container lets you allocate memory in whatever way you prefer. You can opt to a custom heap allocator, a memory pool or even allocate on stack, which may help performance a little if used correctly. This way, you can allocate the node along with the string, which again may help performance. With an intrusive container, you have to take care of all memory management. This is inconvenient and opens doors to potential memory leaks. At least in C, the APIs of intrusive containers are less intuitive and harder to understand, requiring users to have a deeper knowledge in language features. The Boost library argues that intrusive containers are faster with less stress on memory management. They tried to prove this with a benchmark. That goes a little too far. Intrusive lists shine there mainly because their programs “allocate” list nodes from a pre-allocated vector. In practice, we still have to allocate each node individually on heap when deletions are involved or when we can’t preallocate all nodes. Intrusive containers can be faster, but most often they are not. Even when they are faster, the performance gap is small. It is believed among C programmers that intrusive data structures are a great way to achieve generic programming. This is only partially true. First, of common containers, only lists and binary search trees (BSTs) can be made truly intrusive in the sense that they need no heap allocation inside the libraries. Dynamic chaining-based hash tables still have to allocate the bucket array on heap, and they are often slower than open-addressing hash tables and should be avoided anyway. Second, only intrusive lists, the least useful data structure, can be implemented efficiently without ugly macros everywhere. For BSTs, we still have to use the macro magic to achieve the performance of type-specific code. Intrusive containers are not a general solution to generic programming in C.
To most developers, non-intrusive containers are the better choice. However, when you implement a memory allocator or when you micro-manage memory for the best performance, you will appreciate the flexibility of intrusive containers. Combined with a simple memory pool, kavl.h does speed up my program in the end. The following implements the AVL tree example on wiki. Update on 2018-09-29: updated ska::flat_hash_map and tsl::hopscotch_map to the latest versions. Added absl::flat_hash_map, ska::bytell_hash_map and tsl::robin_map. Updated texts accordingly. I evaluated multiple hash table libraries nearly 10 years ago. A lot have been changed since then: hash table is officially part of C++, my khash library is about twice as fast, and more advanced algorithms/heuristics are being applied to hash table implementations. Where are we now? Is unordered_map in C++11 the preferred choice? What hash table library should we use? This post aims to find partial answers to these questions. In this micro-benchmark (source code here), we have N 32-bit integers with ~25% of them are distinct. The task is to find the occurrence of each distinct integer with a hash table. It is inspired by real applications in my routine work. I will show the result first and then discuss all the caveats. In the figure above, each connected line represents a library. Each line harbors 6 dots, corresponding to N=10,18,26,34,42,50 million, respectively. I used multiple numbers to show the effect of rehashing. The X-axis measures CPU time and Y-axis measures peak memory, including temporary swapping space used for rehashing. 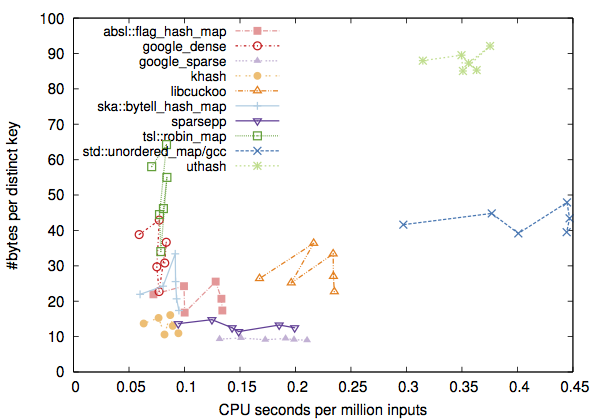 10 years ago, Google’s dense_hash_map was significantly faster than all the peers. It is still among the fastest in this benchmark. 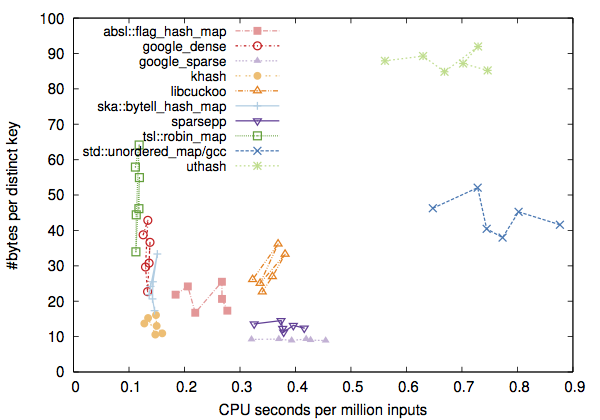 When we consider the speed-memory balance, the more sophisticated probing algorithms such as Hopscotch hashing (used by tsl::hopscotch-map), Robin Hood hashing (by ska::flat_hash_map and tsl::robin_map) and Swiss table (by absl::flat_hash_map) are not better. I speculate this is partially because they need to store extra data in each bucket, which cancels some of their advantages under high load. In addition, these advanced hashing methods are better at query. My benchmark always invokes insertions, though 75% of time no new elements are added. It bugs me that the official unordered_map implementation in GCC-6.3 is that inefficient. In fact, it is slower and uses more memory than SGI’s ancient ext/hash_map and tr1/unordered_map – both of them are still available in GCC. All these libraries use chaining to resolve collisions, which is apparently required by the C++11 spec. It is unfortunate that the C++ standard committee ruled out open addressing. Nearly all the hash table benchmarks indicate open addressing is significantly faster on small keys. As to C libraries, uthash is the most popular, but its performance lags far behind others. When you need a large hash table, ska::*_hash_map and tsl::*_map are the better choices if you prefer C++11 APIs; Google dense_hash and khash remain top options after 10 years. All implementations use the same integer hash function. Switching to the identity hash function has little effect on performance. I haven’t tuned the maximum load factor and the growth factor. They may affect the balance between time and space. Libraries in the benchmark use different memory allocators. For example, khash uses glibc’s malloc that supports realloc, unordered_map naturally uses std::allocator and Google dense_map/sparsepp are using their own allocators. I suspect that memory allocators play a role in performance. More testing needed. There are several other hashtable benchmarks about tsl::*_map, ska::flat_hash_map and ska::bytell_hash_map. These are all good. TommyDS shows a benchmark where it performs the best. That is a bad one because it doesn’t put data into the table (as TommyDS can’t do that). Opic hashtable also has a benchmark. It seems to ignore the effect of rehashing. I thought to evaluate it but couldn’t get it working. The source code repo evaluates several more libraries. Their results can be found in “__logs/*.tgz”. For demonstration purposes, I have translated khash.h to a C++ single header. Khash implements a fairly naive algorithm. It may not work well with other types of data. Modern x86 CPUs implement advanced instruction sets, such as SSE and AVX, which may greatly help performance. However, when distributing precompiled binaries (think about Debian, CentOS, AnaConda, etc), we often prefer to fall back on older instruction sets for the sake of portability. Is there a way to dynamically choose CPU instruction sets at runtime such that we can achieve performance and portability at the same time? Yes, the answer is CPU dispatch. For a program that supports CPU dispatch, we typically compile it on a recent CPU to generate a fat(ish) binary that contains multiple implementations of a function or a code block with different instruction sets. When we run, the program dynamically chooses internal implementations based on the CPU features. I first heard of “CPU dispatch” from an Intel developer a few years ago. Unfortunately, googling “CPU dispatch” does not give me much relevant information immediately even today. This post aims to briefly explain the strategies to implement CPU dispatch in C/C++. On x86, my preferred way to implement CPU dispatch is to detect the supported SIMD instruction sets via CPUID, which can be retrieved with x86 assembly, or with the __cpuid intrinsics specific to MS VC++. The following shows an example. It is known to work with gcc-4.4, icc-15.0, clang-8.0 and msvc-14.0, fairly portable. The second way is to use a GCC built-in: __builtin_cpu_supports(). This function tests if CPU the program is running on supports certain instruction sets. It is a new function only available to recent C compilers. I can confirm it is working with gcc-4.9 on Linux and clang-8.1.0 on Mac. Clang-8.0.0 has this built-in but is buggy: it compiles but can’t link. Intel C compiler (ICC) v15.0 has a similar problem. MS VC++ doesn’t support this function. The IBM compiler appears to has a similar built-in, though it only tests Power-related instruction sets. On x86, this second approach is simpler but less portable. Icc has a similar built-in with an interesting name: _may_i_use_cpu_feature(). Icc alternatively allows to creates multiple versions of a function with a compiler extension __declspec(cpu_dispatch()). Gcc-4.8+ has a similar feature, though for C++ only. I don’t like these methods because they are not portable at all. By the way, there were some interesting discussions on supporting CPU dispatch in the C++ standard. The thread covers serval strategies mentioned here. It went down, though. See the GitHub repo page. In short, KANN is a flexible 4-file deep learning library, supporting convolutional neural networks (CNNs), recurrent neural networks (RNNs) and non-standard topologies addressable with differentiable computation graphs. The initial motivation is that I wanted to understand how deep learning frameworks work, down to the very details. The best way is to implement one by myself. After I got the basic working, I realized the code may be of use to other C/C++ programmers who prefer an efficient and flexible library without carrying all the non-trivial dependencies of mainstream frameworks. So, here we go. Theano and Tensorflow, with a code base many times larger than KANN, are definitely more powerful than KANN. Importantly, they can take the advantage of GPUs and even distributed computing, while KANN not. On the other hand, KANN comes close in flexibility and can be faster in the multi-threading mode for CPU-only training. KANN also has no extra dependencies by default, which makes it easy to deploy. Tiny-dnn is a popular lightweight framework in C++. Importing pre-trained Caffe models is its particular strength that KANN lacks. However, tiny-dnn does not support RNNs and has difficulties in constructing non-standard model (e.g. variational autoencoder). It is several times slower than KANN and mainstream frameworks. Tiny-dnn also requires a C++11 compiler, which is not available everywhere yet (e.g. on CentOS 6). KANN does not support GPU right now. For MLPs and RNNs with no more than a couple of hundred hidden neurons, multi-threaded KANN is actually no slower than GPU-based implementations, because small matrix multiplications have not saturated the capacity of GPU yet. However, for CNNs and large RNNs, I have seen GPU-based implementations outperforming KANN by a factor of 5. The performance gap is probably larger with bigger networks. KANN lacks some important operators, such as batch normalization (BN). A direct implementation of the original BN method is tricky as training needs an extra step different from normal training. It seems that Caffe et al are implementing a variant of BN with running average, but I am not so sure. KANN does not support bidirectional RNNs and seq2seq models out of box. In principle, these models can be constructed with KANN by manually chaining RNN blocks, but I have not tried. If you are looking for a tiny, standalone, performant, open source library in C/C++ that supports common components including MLP, CNN and RNN, and has the flexibility and extensibility close to mainstream deep learning frameworks, KANN might be your only viable choice as of now.